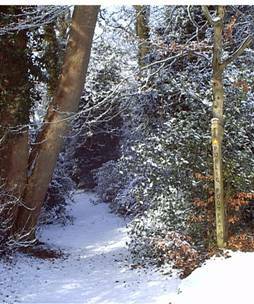 Sadlers Wells Community Woodland (“SWCW”), a registered charity (No. 1105117), was formed to acquire and manage approximately three acres of ancient semi-natural woodland known as Sadlers Wells Wood on the edge of the village of Bunbury near Tarporley, Cheshire for the benefit of the local community and to extend it by the planting of a further two acres with native broadleaved trees. The wood is a remnant of a much larger wood which is mentioned in the Domesday Book and it is a much appreciated local amenity which occupies a prominent position in the Cheshire landscape. The purchase of the wood was completed in January 2006 with the aid of a substantial grant from the Heritage Lottery Fund. The Trustees also gratefully acknowledge the help, advice , donations and assistance given by the Cheshire County Council, Cheshire Landscape Trust, Cheshire Community Council, Cheshire Wildlife Trust, the Cheshire ECOnet Project, Crewe & Nantwich Borough Council, Bunbury Parish Council, Spurstow Parish Council, the Bunbury Society and the many friends and colleagues who have helped and continue to help us. The Charity was re-formed in 2017 as a Charitable Incorporated Organisation (Charity No. 1171849) known as Sadlers Wells Community Woodland CIO. Copyright © 2019 Sadlers Wells Wood. Powered by WordPress. Theme: Spacious by ThemeGrill.